A big hole in Sony's lens lineup has finally been filled with the arrival of the FE 400mm f/2.8 GM OSS telephoto prime. A 400mm f/2.8 is the go-to lens for many sports and nature photographers, so its arrival is certainly welcome for those eyeing up a switch to Sony. Until now there hasn't been a dedicated fast prime telephoto in Sony's E-mount to partner with the likes of the brand's brilliant Sony Alpha A9. The wait looks like it's been worth it though. 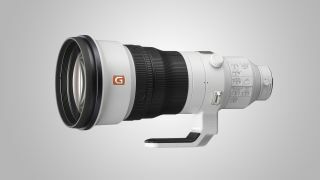 Sony claims this to be the world's lightest 400mm f/2.8 prime lens, weighing in at just 2897g. This weight loss has been achieved through a new optical design that includes three fluorite elements, which has allowed Sony to reduce the number of elements at the front of the barrel, which should mean the lens isn't front-heavy, and balances better when used handheld or on a monopod. Part of Sony's range of flagship G Master lenses, the FE 400mm f/2.8 GM OSS promises an incredible level of image quality and detail. The lens features an 11-blade circular aperture diaphragm that should see the lens produce extremely natural and beautiful background defocus or bokeh. If 400mm doesn't deliver quite enough reach for you, the FE 400mm f/2.8 GM OSS is also compatible with Sony’s 1.4x and 2.0x E-mount teleconverters, while still delivering the same level of autofocus performance. Talking of autofocus, the FE 400mm f/2.8 features two newly developed high-speed XD (extreme dynamic) Linear Motors that drive the focus group. This should see a 5x improvement in moving-subject tracking performance over the older design, with the new motors supported by specially developed motion algorithms to minimize lag and instability. This should all combine to deliver quick, accurate and quiet autofocus. The lens is likely to find itself used in some pretty tough conditions, and to ensure durability it has a tough magnesium alloy construction and comes with a carbon fiber hood. The lens is also dust- and moisture-resistant, and its front element is coated with fluorine to resist dirt and fingerprints. There's a suite of body-mounted controls, including a ‘Full-Time DMF’ switch to immediately engage manual focus at any point, and customizable focus-hold buttons in four different locations on the lens barrel. While Sony's latest full-frame mirrorless cameras feature sophisticated built-in image stabilization systems, the new lens also features a built-in optical stabilization system, with three different Mode settings available depending on the platform you're shooting from, and which take account of panning. The FE 400mm f/2.8 GM OSS includes a drop-in filter slot that accepts 40.5mm ND and other filter types, as well as the optional VF-DCPL1 Drop-in Circular Polarizing Filter. The lens will be built to order and will be available from September priced at £10,500 / $12,000 (Australian pricing to be confirmed).